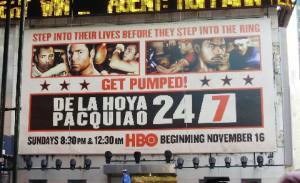 NEW YORK'S TIMES SQUARE IS 24/7 FOR "THE DREAM MATCH" DE LA HOYA vs. PACQUIAO! NEW YORK, NY (November 12, 2008) -- HBO's Emmy-Award-winning all access franchise "24/7" returns with Oscar De La Hoya and Manny Pacquiao in starring roles. The four-episode series "De La Hoya/Pacquiao 24/7" premieres This Sunday! November 16 at 8:30 p.m. ET/PT on HBO. Above and attached is a photo of a billboard for it being installed today in Times Square. "The Dream Match," the welterweight collision between two of boxing's biggest attractions, Olympic gold medalist and 10-time world champion “The Golden Boy” OSCAR DE LA HOYA and current Ring Magazine No. 1-ranked pound for pound champion MANNY “Pacman” PACQUIAO, is scheduled to take place on Saturday, December 6 at MGM Grand in Las Vegas, Nevada, the bout will be produced and distributed live by HBO Pay-Per-View, beginning at 9 p.m. ET/6 p.m. PT.